I have been praying for people to come to know Jesus in a personal way. I started thinking about being thirsty and I was praying that people would thirst. Jesus is the living water, the bible says if we drink from him we will thirst no more. I was praying Lord make people thirsty and then I realised that thirst comes from within. Thirst is not something that anyone can ‘make’ you feel. Thirst is something that is natural and comes from within, its a natural self initiated desire, an instinct that God has put within every human being. I had never thought of thirst in this context before. 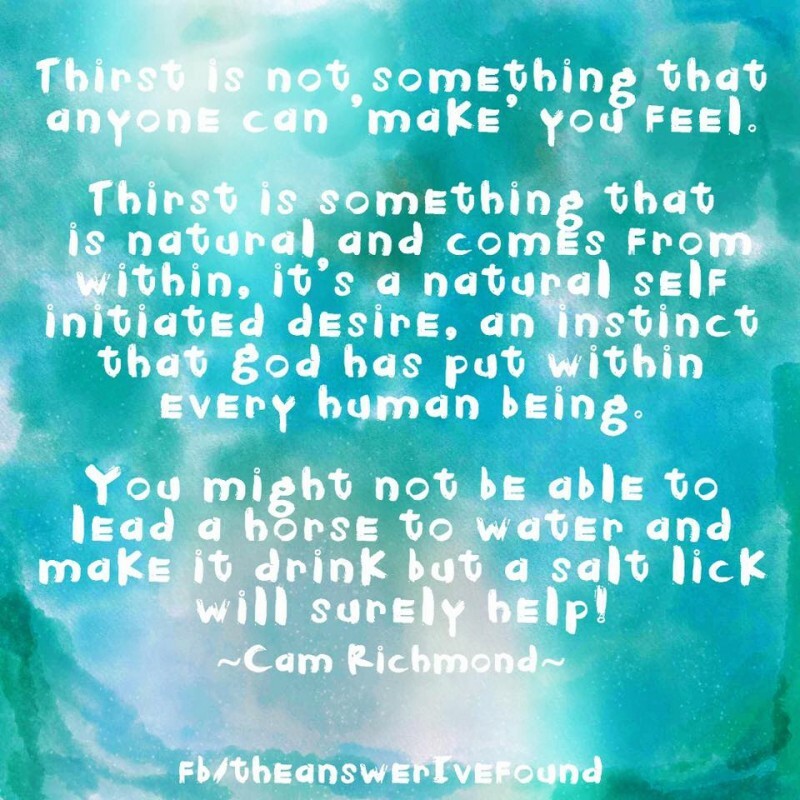 As I was praying about thirst then a word came to my mind and I don’t know if you have even heard of this before but I am not making it up… a ‘salt lick’ came to my mind, a salt lick can be given to a horse in winter to help it increase its water consumption, it provides animals with much needed minerals as well, it helps replenish the salts lost in strenuous exercise too… salt makes horses thirst and drink just like it makes people thirst. I was praying that God would put ‘salt licks’ everywhere – then I realised that we are meant to be the salt, also Gods work is salty, and words are salty, His creation is salty, His thoughts to our minds are all salt and because they increase our thirst and there is a natural pull there from God because he is their creator. As much as our bodies thirst for drink, unbeknownst to some of us our spirits also thirst for God. Many are trying to fulfill their thirst with other things thinking that these will quench the thirst but really there is no possibility of that. God has put something in each of us which draws us all to him…. that can only be filled by him. Ecc 3:11 He has made everything beautiful in its time. He has also planted eternity in mens hearts and minds (a divinely implanted sense of a purpose working through the ages which nothing under the sun but God alone can satisfy), yet so that men cannot find out what God has done from the beginning to the end. Interestingly I don’t often feel thirsty, I hardly think of drinking, water is not my natural thirst, I think of other things to drink – tea, milk, soft drinks etc but water is not something I long for. I know how important water is, and I always ‘try’ and drink it, but its not a natural longing. I have got so used to drinking all these other things. I have been ‘trying’ to drink water more and I hope that one day soon that water will be my thirst quencher, and just as I have been filling my spiritual thirst with all other kinds of things that He would quench that thirst too! I haven’t longed for God enough, for more time in the word, and in prayer… but as I am more often habitually partaking of the word and prayer and worship, my heart is starting to long for it more. Even though the longing isn’t strong enough yet… if I keep putting it in, my spirit will long for it even more and more. There are many people, like myself who don’t feel thirsty because we are preoccupied with other things, or we have not placed value on drinking water regularly and often actually, by the time we feel thirsty our body is already dehydrated… I wonder how much of my life has been spent in dehydration mode!!! By the time we know we are thirsty and hungry for God we are also dehydrated from not having God in our lives like he could be…. And the Spirit and the bride say, Come! And let the one hearing say, Come! And let the one who is thirsty come. And he willing, let him take of the Water of Life freely. Let a hunger and a thirst arise for the truth and for the answers. Lord please cause the desire to know you and know about you increase, let it apprehend, let it beckon, let it draw and urge people closer. Lord let the thirst cause a craving. Your great desire for us to know you and love you. Lord let this thirst be unquenchable by all human, earthly and any other standard, by any means apart from you. Let the quest and the search begin and continue in peoples heart, lives and minds. Lord confound the wisdom of the wise and open their hearts and minds to know you. Show them the deep mysteries of your heart and let them understand in an instant who you are, why you came, and the awesomeness of you love and your plan. Let them desire salt, truth is salt. You are the quench for the thirst this is caused by the salt of truth. When they drink of you they will thirst no more, they will be filled and satisfied and know that all others need this thirst and hunger filled by you too. desire, drink, God, hunger, Jesus, life, need, Prayer, quench, salt, satisfy, thirst, thirsty, truth. Bookmark.